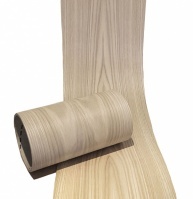 The White Oak Veneer Edging is pre-glued and comes in a 100mm width and 0.5mm thickness. Simply iron on the veneer and trim off the excess. Lengths available are 1 to 10 metre rolls, select from the drop down box above. Suitable for skirting, face material, shelving & plinths. Please see our other listings for Iron on Veneer Edging in additional widths and species. This was oh so easy to use. I use a small travel iron, this provides the right temperature and is light enough and the pre glued oak is of really good quality. Thanks for quick dispatch and quality product! Product looks good and was easy to apply. However one of the lengths bubbled after fitting and would not restick - hence I have had to order 2 meters more to complete the job.